I hadn't really thought a lot about the packaging that I use for the items in my shop, until this little gem from the Etsy newsletter popped up in my inbox. It really got me thinking about the way that I package my items, and made me want to be as unique as the shops that were featured in the article. I wanted to step it up to the next level! I like to protect my items in transparent bags -- just in case the envelope that they are traveling in gets wet -- but there had to be some other ways of packaging my cards and art prints than with just a ribbon and a card that I printed off on some card stock. The new packaging for my cards. The new packaging for my little art prints. I know what you're thinking, "Oh, another person that uses baker's twine in their packaging," but I've always liked the look of baker's twine from any of the shops that I have ordered from. I think it adds a touch of whimsy. 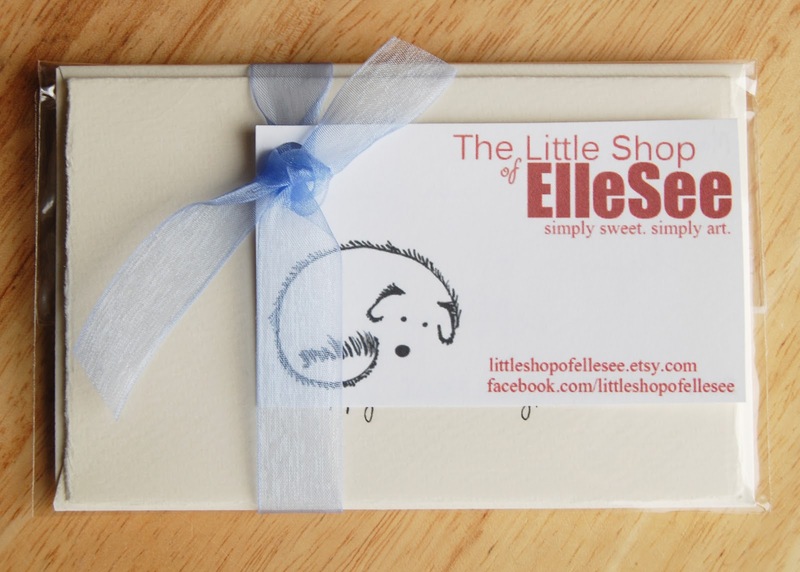 The personal little notes that I write to every customer, as well as my business card, are now tucked inside the package -- I used to write a note on the back of the big business card that I would attach to the package with a ribbon. I was so excited when I came up with this new idea, I hope you like them as much as I do! I think it really looks great! I had a rubber stamp made up with my shop's name on it - not expensive at all and really handy as I can stamp it on my boxes and on my mailing labels AND on the top of my little note-lets that I put in each package. 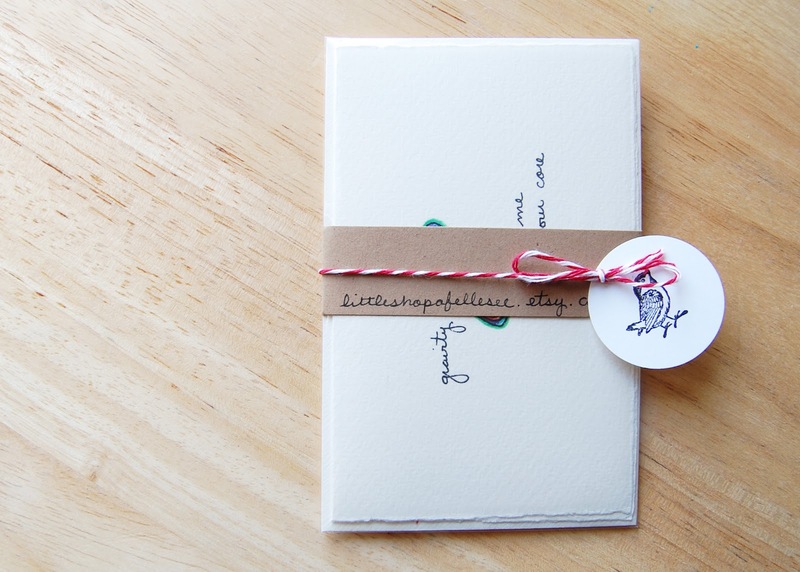 And you could get one made of your handwriting because it looks really neat and has that 'handmade' feel about it. Thanks so much, Cari-Jane! I've been looking at rubber stamps for a while now -- just need to save up some money. 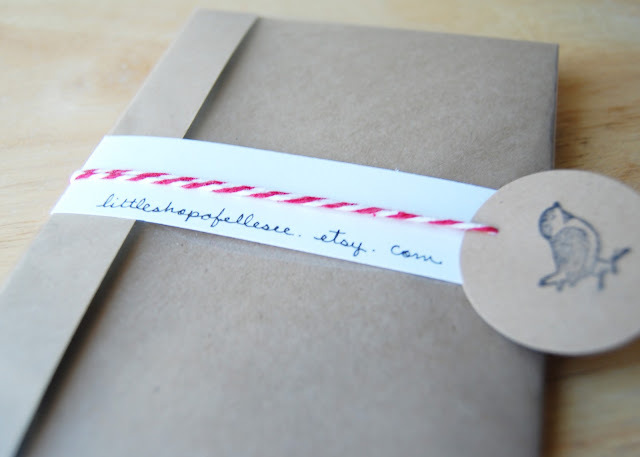 I like the idea of putting it on the mailing package, and the notes to your customers. Such a useful item!